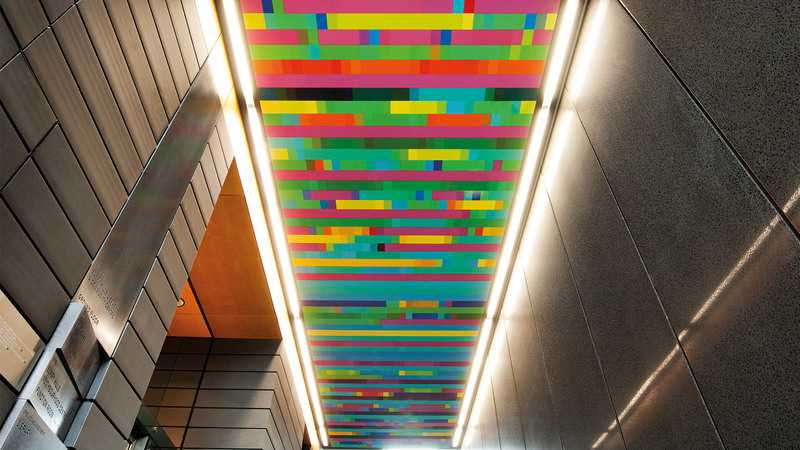 With its rhythmically composed fields of colour, Owen’s artwork plays vibrantly along the first floor soffit of the Surry Hill Centre’s Atrium. This piece continues the artist’s ongoing interest in the representation of musical themes in visual art - by definition, an ‘interlude’ is the connecting passage between the primary sections of a piece of music, providing a restful pause for singers. An appropriate metaphor for an artwork which occupies a transient circulation space connecting the primary Library, Community and Childcare functions of the building. 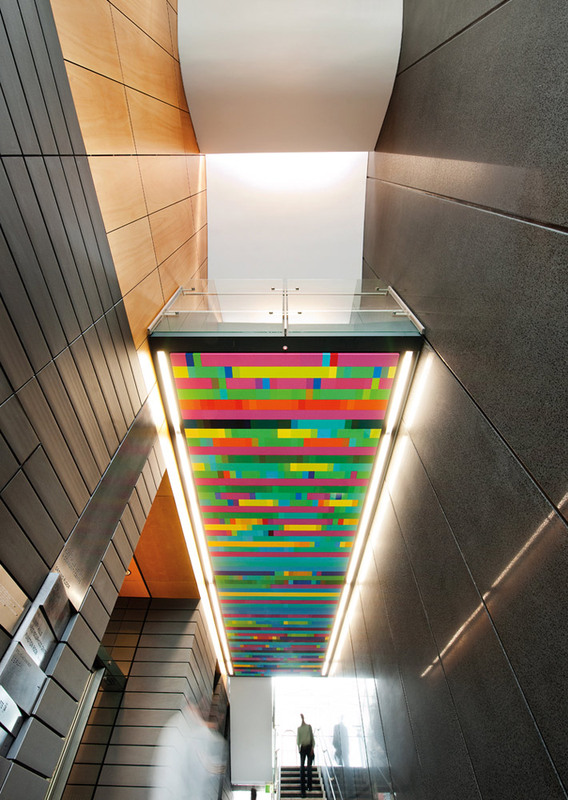 Along its length, the artwork transitions harmoniously from warm saturated tones above the entry to the cooler end of the spectrum at its western end, interacting playfully and kinetically with the observer as they move below it. 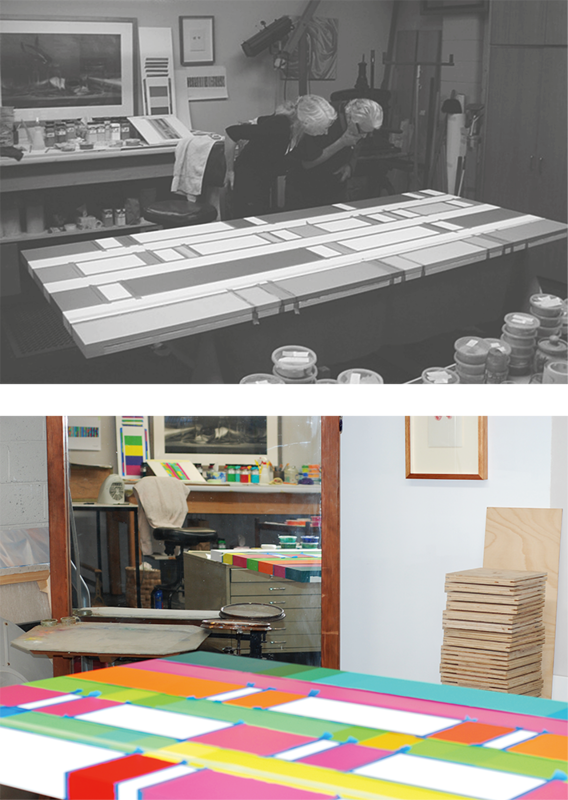 The artwork is 2530mm x 9690mm in size, compsed of synthetic polymer paint on framed hoop pine ply panels. FJMT was fundamentally involved from the outset in the conception and procurement of this public artwork. 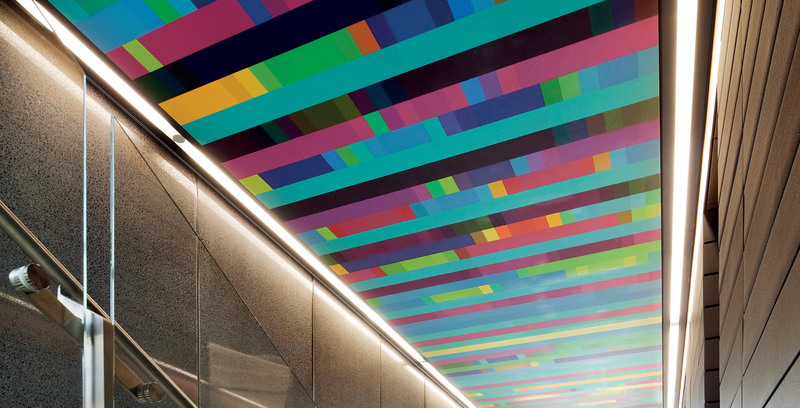 We were responsible for outlining the physical and thematic opportunities for public art across the site, working in close consulation with the client City of Sydney, within the framework of their key public art objectives. We organised and ran the Ideas/Design Competition in-house, undertaking the shortlisting and appraisal of candidates, from which we commissioned Robert Owen to undertake the painting and installation of Interlude. We ran the Design Development process, nominating potential locations for the artwork within the Atrium (including the soffits and precast walls) and aided in the selection of the final artwork configuration by preparing three-dimensional visualisation studies on behalf of the artist. We liaised with Owen throughout the development, fabrication and installation of the piece.